For one day only, it's the return of the Daily Closer! Talks with the Red Sox are moving. Theo and I have spoken multiple times daily over the past week and given the current situation I am feeling very confident that we will be able to finalize a 1 year contract to allow us a chance to finish our career as members of the Red Sox organization. 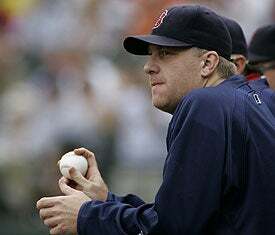 My question: If Schilling already wrote farewell notes to all his teammates, should he be allowed back? My vote is no. * = May not be joined by Bonds.